As usual, it's been a busy past few months. Between web design classes, freelance work, and my own illustration projects, my creative plate has been quite full! I'll be posting some of my web and graphic design work in the coming weeks. Because my portfolio is rapidly expanding and evolving, I'm also working on a major overhaul of my website. I'm hoping to add an online store to the new site as well, through which prints, posters, etc. of my illustrations can be purchased. I'll post updates as the site develops. 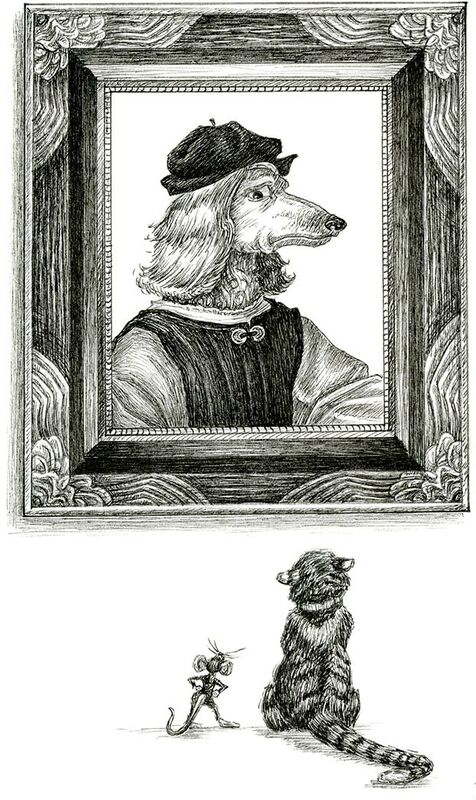 A few months back, I put up some process work behind one of my pen and ink illustrations, Portrait of a Dog...as Raphael's Angelo Doni!, but never posted the finished version. Well, the wait is over! Here it is in all of its black and white glory!